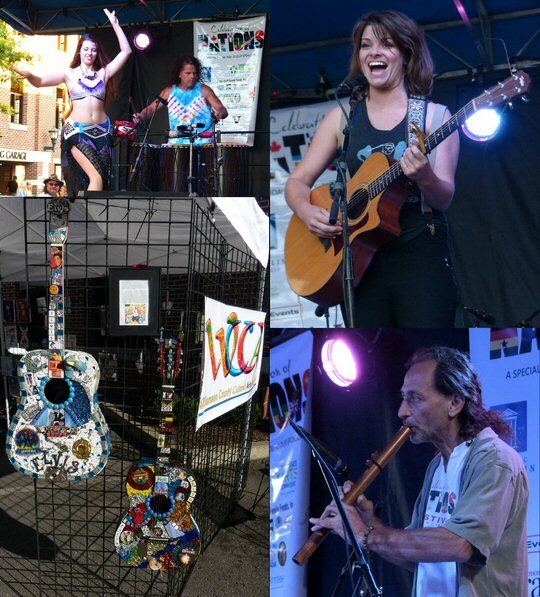 On October 8, 2016 from 10 a.m. to 8 p.m. the Sister Cities of Franklin and Williamson County hosted the eighth annual Celebration of Nations festival in historic Franklin, Tennessee. The mission of the Celebration of Nations is to create global and cultural passion, beginning with a personal knowledge and understanding of the interconnectedness of people universally. They believe one way to accomplish this goal is through genuine artistic and sensory representations of various nations and what better way to do that than a street fair. 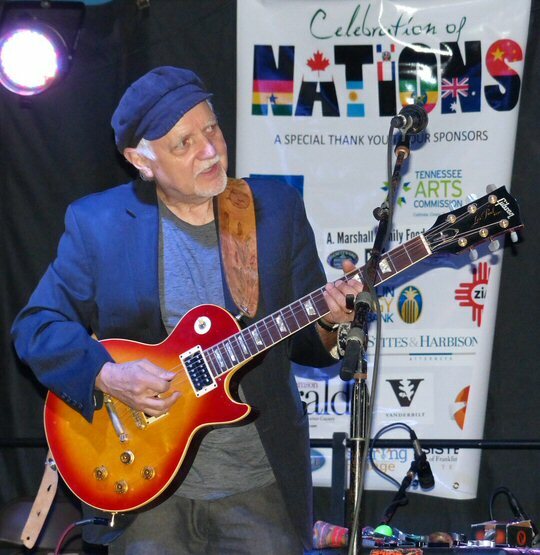 Phil Keaggy on electric at the Celebration of Nations. The Celebration of Nations was an open air event that featured international crafts and foods. Beers and wines from different countries were also available. Saturday was a pleasant day with a bit of wind blowing the flags of the nations. A stage was set up on 4th Street in thriving downtown Franklin. The music started around noon showcasing respected artists such as Bob Teague and the animated Anthony Adams & The Nite Owls. In addition to bands there were drummers and dancers including the crowd pleasing contortions provided by the lovely Sunshine Jupiter. Prior to Phil Keaggy who capped off the festivities was Daphne & The Mystery Machines who presented a catchy and compelling set of music. Miss Daphne armed with an acoustic was personable as she shared some insights behind her lyrics. “Killin Me Smalls” was about dates not working out. The song meandered through a melancholy mood before building momentum with multiple singers adding to the storytelling. “Piggy Bank” along with a newer tune “Bucket of Shame” showcased stellar song craft and musicianship from The Mystery Machines. The group closed with a passionate piece called “Resurrection”. As Daphne finished up she referred to guitarist Phil Keaggy as her hero. 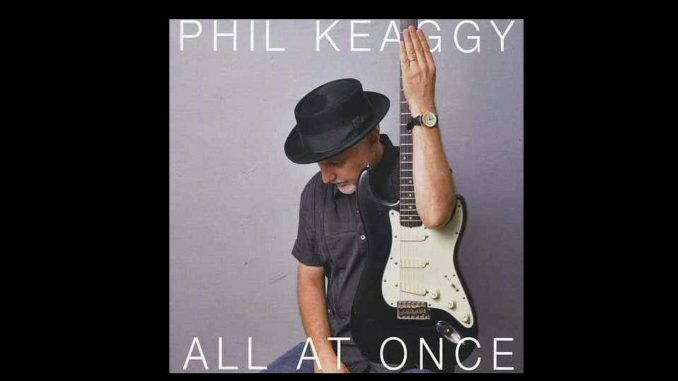 Folks soon found out why Daphne and others would call the humble Phil Keaggy a hero. Phil is a well-respected guitar player who uses a looping device to create the effect of leading a full band. Although this was a secular event Mr. Keaggy shared his beliefs. He started with the opening track from his latest release All At Once. Phil’s acoustic guitar playing was clean and crisp as he quickly added layers to the melodic “Mercy”. Next was an instrumental from Beyond Nature a beautiful and nuanced composition. Phil Keaggy a long time Beatles fan presented his own bright version of “Here Comes The Sun” flowing into the spirited “Salvation Army Band”. Keaggy tapped his instrument to craft one of a number of sequences for the track. Later he changed the tuning right in the middle of the song. Sunshine Jupiter, Daphne and Massood Taj in Franklin. “Not Be Moved” also from the new album was a more straightforward presentation allowing Phil’s words of wisdom to stand strong in faith be the focus. Towards the end of his proclamation he melded taps and more tricky techniques into the mix. “Love Broke Thru” from one of Phil’s early LPs still sounded sweet. Next, Keaggy added percussion to the lush “Shades of Green” another intricate instrumental. “Just want to sing the Name,” declared Phil as he closed with “Let Everything Else Go” from Town To Town (1981). Although this was a condensed concert for Keaggy he still managed to play a career spanning set of his classic and current tunes. Keaggy switched to a Sunburst Les Paul to join other artists from the day for the last two songs of the night. The group concluded with “Let It Be” by The Beatles bringing this year’s celebration to a close and don’t forget to mark your calendars for Columbus Day weekend 2017 when this fun festival showcasing international flavors and music returns to Middle Tennessee. 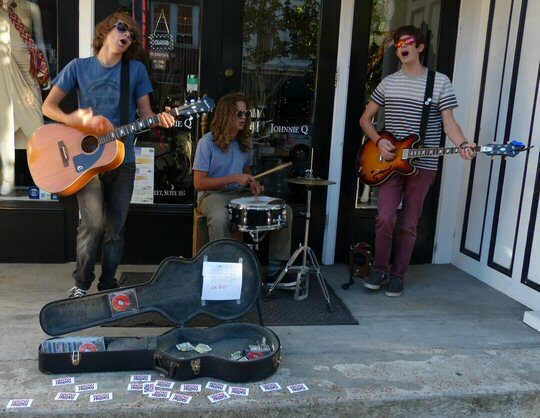 The Wacky Friday were busking it on the streets of Franklin. Throughout the day the performing artists offered shout-outs from the stage to the mysterious multi-instrumentalist Massood Taj who was serving as stage manager for the event and he was also responsible for organizing all the musical acts for this year’s festival. A quick excursion on the bustling Main Street in Franklin also revealed more free live performers as we ran into the young and talented “The Wacky Friday” who were busking their Beatlesque stylings to passersby on the edge of Music City. 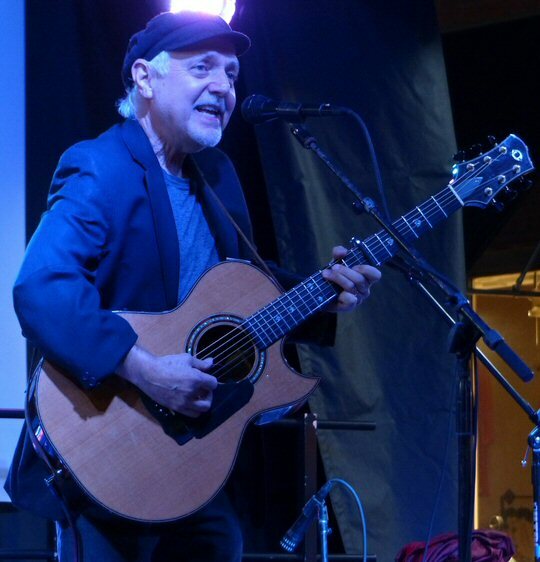 For over forty years, headliner Phil Keaggy has blessed people with his music. He has over 60 solo albums, both instrumental and vocal to his credit, along with 8 releases from his power trio Glass Harp. Keaggy continues to sell out concerts all over the United States, with his ever-changing style, ranging from rock-and-roll to fully orchestrated instrumental compositions. He has been a devoted Christian since the early 1970’s and much of his music reflects his faith. Phil won his first Dove award in 1988 for his instrumental album, The Wind and the Wheat Phil’s second Dove Award came in 1992 for his Celtic-influenced, Beyond Nature Each year from 1998 to 2001, Phil has dominated the “Instrumental Record” category at the Doves, winning for Invention, Acoustic Sketches, Majesty and Wonder and most recently Lights of Madrid. Phil has also been voted one of the top fingerstyle guitarists by Guitar Player Magazine readers. Phil Keaggy on acoustic at the Celebration of Nations.